The steadily increasing global energy consumption increases the number of environmental issues and corresponding risks associated with it. This eventually put pressure to develop green and renewable energy products and at the same time more emphasis on reducing the conventional energy consumption. In fact, we ignore one important energy source which could transform the way we act, adopt and consume the energy in future i.e. Human energy. The human body contains enormous quantities of energy; the average adult has as much energy store in fat as a one ton battery. That energy fuels our everyday activities but whether these human actions/motions turn to generate the electricity? Most of the innovators around the world are harping on our potential energy to run the electronics products/gadgets. There are plenty of examples of new innovative products and systems which indicate and confirm the replacement of conventional energy with human powered equipment. As we know that human movement produces kinetic energy which can be converted into power. The human energy is 100% green and non-polluting except some amount of CO₂ gets emitted to the atmosphere which is very marginal compared to fossil fueled electricity. More importantly, human powered products help their users to think in a different way; by encouraging their effort in producing own energy and the waste of energy is made apparent for once. The sustainable development might mandate a shift from global to local production consumption which is really a positive thing. 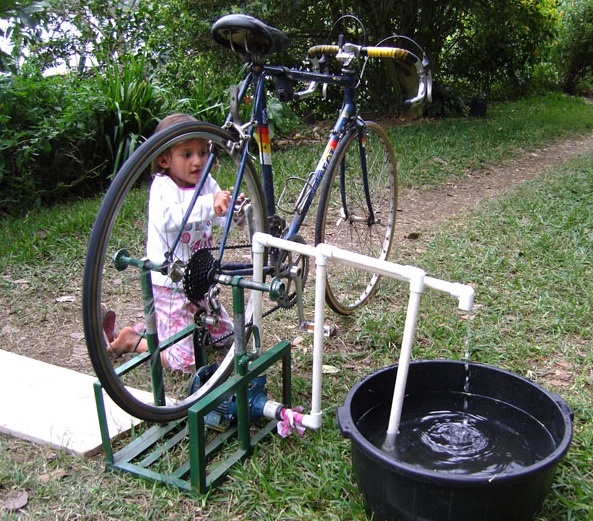 A good example of human powered Play pump system which is being used in African countries largely in the rural areas where there is insufficient electricity to run the electric equipment. Access to clean drinking water is vital for human survival and is critical to improving the lives of those living in poverty in developing countries. Play pump system allows for easy access to clean drinking water and simultaneously providing children an outlet to play. Let’s think all the people in the fitness clubs around the world and the energy that’s could be generated while exercising and how this human power could be used instead of going to waste! People go to fitness clubs to improve their health, but at the same time, with no additional effort, they could also be producing clean, renewable energy, thereby improving the health of the environment too. It’s a fantastic thought and in fact it’s already being implemented in most of the developed countries. If we refer Mr. David Butcher’s website; he has been working on a method to use human generated power to run appliances in the house. He plans to build a device that just about anyone could use to power a variety of small household equipment as well as to charge batteries for later use. We should really appreciate such a wonderful environment conscious person who thinks & dedicates his life for the betterment of society as a whole. “Pedal power utilizes the most powerful muscles in the body; the quads, hamstrings and calves; converting ninety-five percent of exertion into energy.” Bart Orlando, Humboldt University. As per scientific study, an adult person burns 125 calories by walking 3 mph on a treadmill per half hour. I.e. 290.656 watts per hour power generated! The potential of pedal powered electricity is to use various house hold appliances and to charge emergency batteries in case of power failure. By doing simple things in our daily life we can save the planet. Now, we will discuss about different potential use of human power. The creation of green gyms where people pay their membership fees as usual, but swipe their membership cards before and after they use the machine for their daily workout. This is to calculate the power produced during exercise in a year and redeem the equivalent annual membership fees. 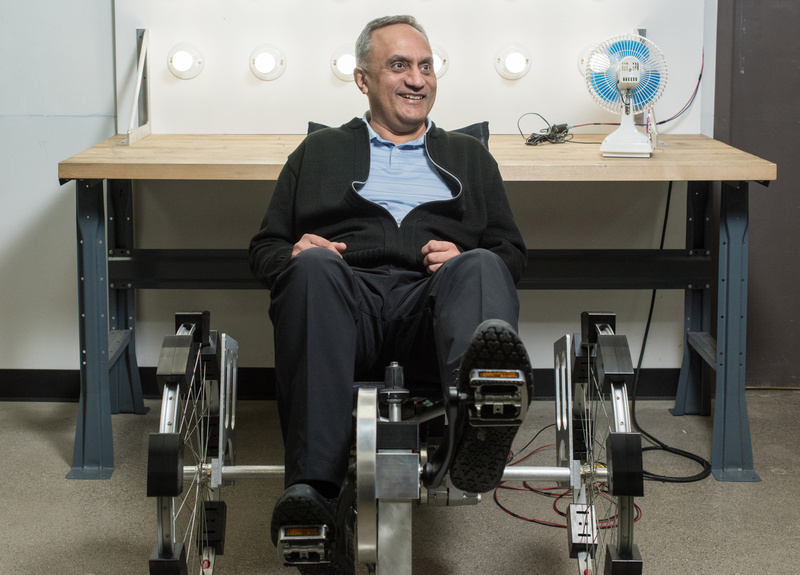 Sri International, research firm in Menlo Park, CA, is working with Defense Dept to create a shoe that will convert the mechanical energy of walking into electric power to electrify the devices such as batteries or cell phones. 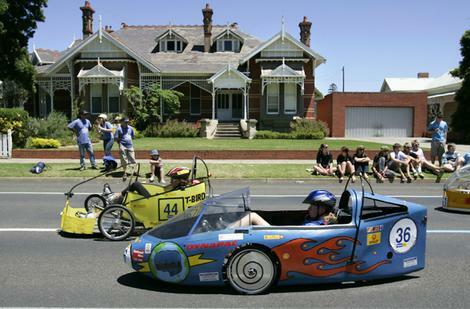 A human car or human propelled car is another novel example of potential use of human power. A four passenger human car is made of steel tube frame chassis which propels with the co-ordinated efforts of all passengers. The human car is not about changing the world, but it is an alternative way of making the world greener. A foot-powered generator (EGAS); is the world’s 1st power generator that is able to be used in an unventilated home because it doesn’t use combustible fuel to produce power. The five minutes of step-down effort can produce 30 minutes of usable power. An innovative Yo Yo powered MP3 player requires only 10-12 tosses per hour to play the MP3 player. This is very useful where no electricity is available (while walking, travelling). Human powered generators could be located within flooring and stairs to extract electric power from the movement of human in crowded places like pubs, heavy traffic areas, train stations, etc. Through use of a matrix of hydraulic compression cushions, where footsteps push fluid through a micro-turbine which generates power and stored in a super-capacitor. Advances in energy scavenging technologies such as Nanogenerator with zinc oxide fibers, MEMS based micro generators and piezoelectric materials designed for energy harvesting, Bio-thermal power source, etc. The image shows how to control traffic with the help of human power. There is a space comparison for three different mode of transport; car, bus and bicycle. 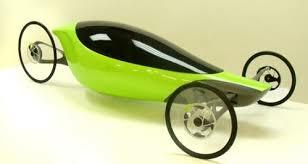 The environmental point of view, bicycle (human powered vehicle) gives better edge than other two options. Now researchers are finding new ways to increase harvest efficiencies and lower costs. Developers are also making electronics that use much less power so that one day your phone may run on the rustling in your pocket and a few finger taps when you make a call. Researchers in the UK also recently developed a piezoelectric generator, a knee brace that scrounges electrons from walking. The bottom-line is the acceptability, scale and continuous availability of human power in the society. Still, we have a long way to go for replacing the conventional fossil fueled power with human power. Further focus should be on research and development to get the innovative products which requires less energy and could be maximum run with human power. One thing we should accept that looking at huge population; the human energy will be a great alternative source of energy to some extent in future.